Cash Shop Update For March 14 | Dexless, Maplestory Guides and More! 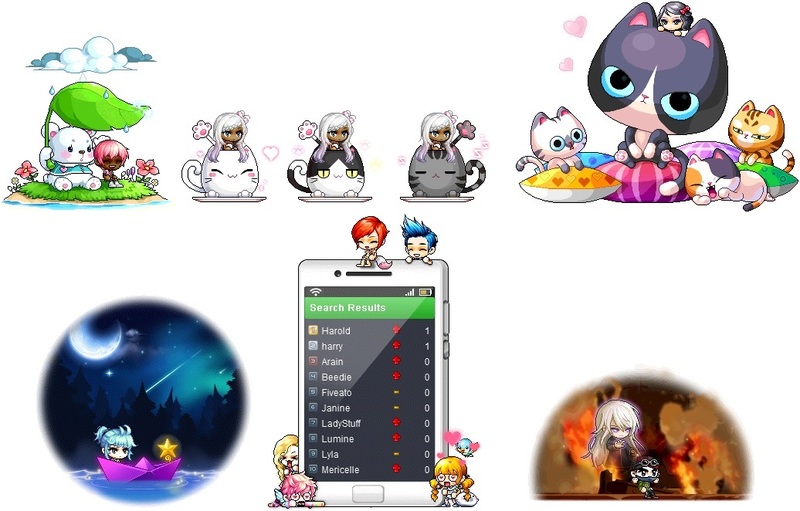 Discussion in 'Maple Updates' started by Nexon, Mar 14, 2018. March 14 to March 27 in the Appearance category in both Reboot and non-Reboot worlds. Update your character's look with a Royal Hair Coupon themed to look just like one of the characters from Evangelion! Evangelion hairstyles are available for Shinji Hair, Kaworu Hair, Rei Hair, Mari Hair, and Asuka Hair. Please note that certain hairstyles are only obtainable with certain genders, and that these hairstyles cannot be dyed to change color. Check out the other Male Hairstyles available now: Ice Pop Hair, Dylan Hair, Prince Ponytail and Aqua Hair. Check out the other Female Hairstyles available now: Natural Hair, Sweet Creme Hair, and Jubilee Hair. Check out the Male Face Styles available now: Cool Elf Face (NEW! ), Dark Charisma Face (NEW! ), Caterpillar Brow Face, Hoi Poi Face, Marron Face, and Round Face. Check out the Female Face Styles available now: Darkhound Face (NEW! ), Gentle Elf Face (NEW! ), Enlightened Face, Lily Face, Mr. Moon Face, and Saucy Face. March 14 to March 20 in the Special Promotions > Limited Time category in both Reboot and non-Reboot worlds. Each St. Patrick's Day Surprise Style Box holds a random permanent equip with a St. Patrick's Day theme, with 50 different permanent items available! In non-Reboot worlds, you can trade these style box items with other players through the Cash Item Trade window, if you haven't equipped them. Right-click on a character to see the menu. Check out some of the amazing items you can get from the St. Patrick's Day Surprise Style Box! Left to Right: Slither Style Cap, Green Hard-Rimmed Glasses, Green Baseball Jacket, Slither Style Pants, Slither Style High-Tops, and Sweet Snake; Dinofrog Hat, Dinofrog Outfit, Dinofrog Gloves, Dinofrog Shoes, and Musical Green Onion; Slime Earrings, Blooming Leafy Love Outfit (F), and Leafy Dream Wings; Bold Slime Hat, Green Sports Goggles, Green Electric Guitar, Green Tie & Shirt, Green Rolled-Up Shorts (M) and Green Sneakz. Left to Right: Superstar Headphones, Slither Style Hoodie, and Yellow-Green Backpack; Green-Rimmed Glasses, Green Tie Casual Suit, Green Classic Sneakers, and Elven Spirit Cape; Melon Shaved Ice Hat, Lime Green Sleeveless, Green Skirt (F), and Green Sneakz; Olive Beanie, Green Shutter Shades, and Military Cargo Jacket (M); Leaf, Green Shades, Green Overall Shorts, and Green Blazing Sword; Apple-Green Hood, Apple-Green Sweater, Slither Style Pants, and Green Classic Sneakers; Dinosaur Snapback, Vintage Hoodie Jacket, and Slime Slippers. Put together a fun outfit for St. Patrick's Day with these green items! March 14 to March 27 in the Special Promotions > Limited Time category in non-Reboot worlds only. Take home the pets from the Stellar Detectives! Choose from Lil Tutu, Lil Nene, and Lil Lingling! The individual pet packages come with an equip to wear, yummy pet food to eat, a Pet Name Tag, and some useful pet skills and scrolls. March 14 to March 27 in the Special Promotions > Limited Time category in Reboot world only. Take home the pets from the Stellar Detectives! Pick up Lil Tutu, Lil Nene, and Lil Lingling and let these little buddies join you on your adventures in Reboot world! Available in the Special Promotions > Daily Deals category in non-Reboot worlds only. On March 17, we will be having a special deal on Red Cube, Black Cube, and Bonus Potential Cube Adventurers' Packs, which contain 60 Red, Black or Bonus Potential Cubes, as well as 5 Philosopher's Book items, Violet Cubes, and a Golden Hammer 100% Coupon! You have until 12:59 AM PDT / 3:59 AM EDT / 8:59 AM CET / 6:59 PM AEDT on March 18 to purchase these items. Make sure to move them from your cash inventory to your item inventory and use them soon! On March 17, we will also be having a special deal on Red Cube, Black Cube, and Bonus Potential Cube Mega Packs, which contain cubes and a Unique Potential Scroll 30% Coupon! On March 17, we will also be having a special deal on Red Cube and Black Cube Packages, which contain Red or Black Cubes and a Gold Potential Stamp Coupon! On March 17, we will also be having a special deal on Silver and Gold Bonus Potential Cube Packages, which contain Bonus Potential Cubes, Potential Stamps, and Special Bonus Potential Scrolls! On March 17, we will also be having a special deal on Red Cube, Black Cube, and Bonus Potential Cube bundles! Available in the Special Promotions > Daily Deals category in Reboot world only. On March 17, we will also be having a special deal on single Red Cubes and Black Cubes, as well as 6-packs of Red Cubes and Black Cubes! Available in the Special Promotions > Daily Deals category in both Reboot and non-Reboot worlds. On March 18-19, we will be having a special deal on Fusion Anvils and Medal Fusion Anvils! You have until 12:59 AM PDT / 3:59 AM EDT / 8:59 AM CET / 6:59 PM AEDT on March 20 to purchase these items. Make sure to move them from your cash inventory to your item inventory and use them soon! On March 18-19, we will be having a special deal on Scissors of Karma and Platinum Scissors of Karma! You can use these items to make certain untradeable equipment tradeable one time. March 8 (after maintenance) to March 29 (before maintenance) in the Random Rewards category in non-Reboot worlds only. The Great Gachapierrot has added a ton of new items, with massive mounts and chairs available now! Check out the Moonlight Cafe Chair, less a place to sit down and more a portable cafe, perfect for curling up with a good book and cup of tea. 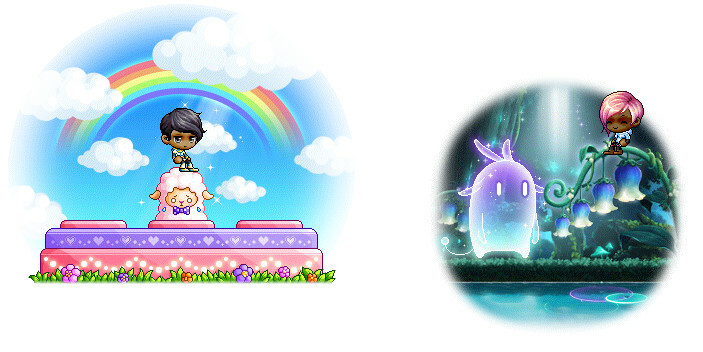 Take a load off with the massive Rainbow Sheep Chair and Arcana's Spirit Chair! Show off your preferred method of travel by putting the Cat Camping Car Chair and Electric Cable Car Chair in park! Swing from the tree in actual swings with the Gentleman's Bluebird Swing, Lady's Bluebird Swing, and Forest Sanctuary Chair. Be fancy, be sweet, or be #1 by taking a seat in the Fairytale Palace Chair, Candyflower Chair, or Captain Finger Chair. See the circus, amuse a very rude bunny, send a slime as high as you can or just enjoy some tea with the Trainer Field Chair, Electrifying Bunny Chair, Slime Launcher Chair, and Mint Kitty Tea Time Chair. Hide out in nature and surprise your friends with the Hidden Henesys Chair, Bouncy Froggy Pond, and Hidden Pantheon Chair. There's more adorable chairs here with the Cat Bench, Watermelon Slide Chair, Happy Floral Shoe Chair, and Doll Day Chair. The lovely chairs just won't stop, so grab a seat with the Flower Fantasia, Rainbow Chair, Sheep Shearing Chair, Reading Chair, Spring Flower Corsage Chair, and Rabbit Sofa. The additions wrap up with the Super Giant Mushroom Chair, Bunny Tornado Chair, My Buddy Nao Chair, Schrodinger Chair, and Welsh Corgi Chair! The new mounts include plenty of big ways to get around Maple World in style, and all of these mounts are available as permanent versions. Get your hands on the Beefy's Food Truck Mount, Twinkling Cotton Candy Mount, Decapatruck Mount, and Double Red Truck Mount! But if you prefer getting your rides from the fluffier (or feathery, or scaly) side of the tracks, go for the Kangaroo Mount, Double Frog, Eagle Mount, Giant Rooster Mount, Flying Blue Sheep, and Flying Pink Sheep! New mounts have also come to Andersen's Box! Get the Beefy's Food Truck Mount, Twinkling Cotton Candy Mount, Decapatruck Mount, Double Red Truck Mount, Kangaroo Mount, Double Frog, Eagle Mount, Giant Rooster Mount, Flying Blue Sheep, and Flying Pink Sheep. These mounts are all available as 90-day versions. March 7 to April 4 in the Special Promotions > New Arrivals category in both Reboot and non-Reboot worlds. If you're going for the premium look, the Premium Surprise Style Box has the most sought-after styles in all of Maple World! Each Premium Surprise Style Box holds a permanent random decorative item! These items are regularly found in the Random Rewards > Surprise Box category in the Cash Shop. There are 100 different permanent items available from the Premium Surprise Style Box. In non-Reboot worlds, you can trade these style box items with other players through the Cash Item Trade window, if you haven't equipped them. Right-click on a character to see the menu. Left to Right: Ribbon Headband (M), Sensible Denim Outfit (M), Crystal Fantasia Wand, and Rainbow Marbles; Serene Heart Hair, Doll's Nightwear, Half Bandage, and Take Me Too! ; Flower Butterfly, Teddy Surgeon Mask, Sweet Baguette, and Sensible Denim Outfit (F). Left to Right: Silky Skater Band, Sunny Day Rainbow, Skater Fangirl (F), and Retro Roller Skates; Lucid's Silk Hat, Lucid Dream (M), and Dancing Fireflies; Pinky Butterfly Hair Pin (F), Rainbow Sparkle, Sensible Denim Outfit (F), and Twinkling Rainbow. Left to Right: Lucid's Silk Hat and Lucid Dream (F); Smiley Skater Lid, Skater Fanboy (M), Retro Roller Skates, and Skater Love Cape; Memorial Angel and Sweet Patissier (M); Drifting Heart Hair, Doll's Nightwear, Half Bandage, and Bound by Dreams. March 7 to March 21 in the Special Promotions > Limited Time category in non-Reboot worlds only. Take home this permanent Lil Damien pet! He comes with an equip to wear, yummy pet food to eat, a Pet Name Tag, and some useful pet skills and scrolls. March 7 to March 21 in the Special Promotions > Limited Time category in Reboot world only. Let the Lil Damien pet join you on your adventures in Reboot World! February 28 to March 27 in the Special Promotions > Limited Time category in both Reboot and non-Reboot worlds. A laboratory incident creates an inter-dimensional rift that allows the heroes of Evangelion to come to Maple World. Prepare to meet Evangelions, the amazing heroes that pilot them, and invading Angels in this special limited-time crossover event! For a limited time, you can purchase a special Evangelion Surprise Style Box that contains accessories, outfits, and hats to dress up your MapleStory character. There are 50 different permanent items available from the Evangelion Surprise Style Box, providing a mix of items themed for Evangelion, as well as regular MapleStory equips. In non-Reboot worlds, you can trade these style box items with other players through the Cash Item Trade window, if you haven't equipped them. Right-click on a character to see the menu. Check out the Evangelion items you can find inside the Evangelion Surprise Style Box. Asuka Plugsuit, Asuka Hat, Rei Plugsuit, 4th Angel Hat, and AT Field. Check out some of the other items you can find inside the Evangelion Surprise Style Box. Iron Mace Uniform Hat, Iron Mace Uniform Outfit (M), Iron Mace Uniform Shoes (M), Iron Mace Uniform Weapon, Iron Mace Uniform Outfit (F), Iron Mace Uniform Shoes (F), G Clef Word Bubble Ring, G Clef Label Ring, Black "Hit Me" Shirt, and Vellum Mask. February 28 to March 27 in the Special Promotions > Limited Time category in non-Reboot worlds only. Purchase an Evangelion Random Box in a non-Reboot world and open it up to receive one random item! This box contains items from Evangelion including the Kaworu Duet Chair, Heroine Chair, AT Field, Asuka Android Coupon, and Rei Android Coupon. The box contains regular MapleStory items in addition to the Evangelion-themed items. You may find different items depending on whether you purchase the box in Reboot or non-Reboot worlds. February 28 to March 27 in the Special Promotions > Limited Time category in Reboot world only. Purchase an Evangelion Random Box in Reboot world and open it up to receive one random item! This box contains items from Evangelion including the Kaworu Duet Chair, Heroine Chair, and AT Field. Check out chairs like the Maple Swingboat Chair and Waterwheel Chair. Android Ear Sensor Clip: Double-click to make the ear accessory sensor of your equipped Android transparent. If the equipped Android's ear accessory sensor is transparent, you can use a new sensor to change back to the original sensor. 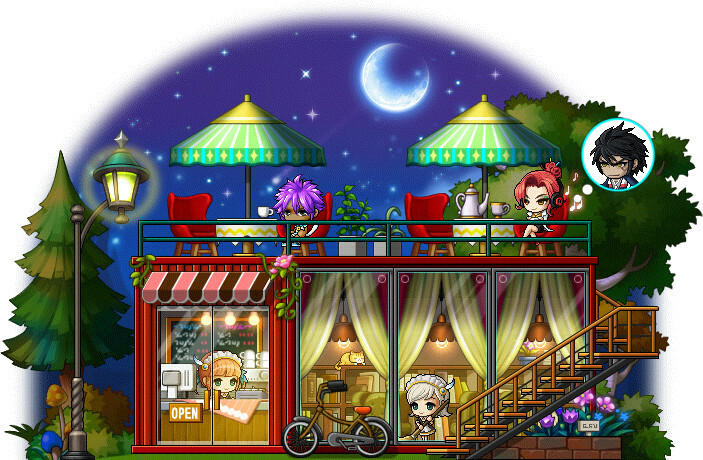 Android Shop Coupon (30 Day): Double-click to grant the equipped Android a shop function for 30 days. Can only be used on Androids without a shop function.